As Gamemaker Plutarch Heavensbee plans to make the 3rd Quarter Quell the most memorable Games yet, Haymitch Abernathy sniffs around to help save his mentored-and-now-champion duo of Katniss Everdeen and Peeta Mellark, the two who are thrown into the politics of the game to the expense of pretending they love each other. Now that these two champions' act have been discovered, President Snow is on an outrage and forced to take precautionary actions to stop a rising revolution and the Gamemaker may just be the one person he needs to eliminate these threats. What can you say of this new still from The Hunger Games: Catching Fire taken by Murray Close? 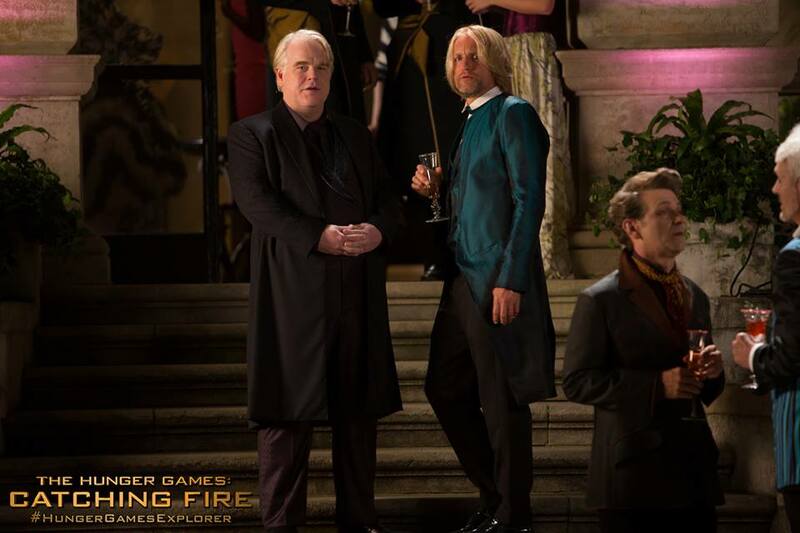 Philip Seymour Hoffman and Woody Harrelson star as Head Gamemaker Heavensbee & mentor Haymitch Abernathy in The Hunger Games: Catching Fire. The Hunger Games: Catching Fire begins as Katniss Everdeen has returned home safe after winning the 74th Annual Hunger Games along with fellow tribute Peeta Mellark. Winning means that they must turn around and leave their family and close friends, embarking on a "Victor's Tour" of the districts. Along the way Katniss senses that a rebellion is simmering, but the Capitol is still very much in control as President Snow prepares the 75th Annual Hunger Games (The Quarter Quell) - a competition that could change Panem forever. The Hunger Games: Catching Fire will fuel the revolution on November 22, 2013.